Join us for an interactive discussion of today’s energy talent shortage, the drivers behind it, mistaken perceptions about the industry, and the best practices of companies and educators. Driven by the results of new Manpower research, we’ll dive into Strategies to Fuel the Energy Workforce. We’ll provide a framework for understanding the workforce strategies that energy companies can use to gain competitive advantage and ready themselves to compete domestically and globally. + Cheryl Knight, President, Knight & Associates Ltd.
Join ManpowerGroup for a complimentary webinar designed to tell you everything you ever wanted to know about negotiating. In this fun and fast-paced hour, Mark will share the best-ever negotiation tips in the history of the universe based on all the latest research… and his 20+ years of legal experience. You’ll walk away with a series of simple yet powerful negotiating tools you can put to use immediately. •Negotiation essentials that everyone in business should know. •An understanding of negotiation pitfalls and how to avoid them. •Practical, real-life examples of negotiation successes and failures. •A handy checklist you can use to assess and improve your negotiation skills. • Who should be networking? • Where does networking take place? Health Care Reform continues to be an important topic with far reaching implications. The impact on employers and individuals, as well as the insurance and health care industries, are top of mind for every employer. DISCLAIMER: This presentation and the materials are provided for informational purposes only and should not be considered legal or HR advice. Please consult your HR or Legal representative before using or implementing any of the processes or information contained herein. Complimentary Continuing Education Credits: This program has been approved for 1 recertification credit hour toward PHR, SPHR and GPHR recertification through the Human Resource Certification Institute (HRCI). Please be sure to note the program ID number on your recertification application form. For more information about certification or recertification, please visit the HRCI homepage at www.hrci.org. As leaders, you are being challenged to find new ways of engaging your employees to drive productivity and meet business goals. Unleashing your employees’ potential will be the most important competitive edge to drive future success and growth. • Do your managers develop their people and drive the talent pipeline by having effective career discussions with their employees? • Do your employees take ownership for navigating and managing their own careers in ways that will support your business needs? Join us for “They Gain, You Retain – Creating a Culture of Career Development.” During this webinar, we will discuss how you can think differently about your career development programs to drive engagement and retention strategies. Hear the challenges your peers are facing and how they are dealing with key issues. For every resumé you send out, how many do you think get read by employers? Probably nowhere near as many as might you think. Employers are using smarter technologies and search tools to make the hiring process more efficient and save them time and money. How do you make sure your resumé makes it to the top of the “must-read” pile and doesn’t end up in the recycle bin? In this webinar, you’ll learn how to turn your resumé into a strategic, highly-customized document. We’ll discuss ways to clearly convey your knowledge and expertise as well as ideas for building and showcasing your personal brand. Your resumé should tell the true story of the best candidate for the job: you. ***Please note this webinar is NOT eligible for HRCI recertification credit. With the economy improving and more job opportunities becoming available, there is a pool of highly qualified individuals looking for better career opportunities. However, this also means your business is in danger of losing your best talent to competitors. Are you prepared for the upcoming talent war? Join this interactive panel session to hear industry experts discuss how to take advantage of the turnover wave with tips on retaining your best talent and strategies for recruiting top candidates for your business. Hosting this webinar is Mark Toth, Chief Legal Officer of ManpowerGroup™ North America, a former partner in a major employment law firm, and well-known for his ability to present legal and HR issues in a uniquely entertaining style. With the undersupply of qualified talent and more competition to find and recruit them, it is vital to your businesses’ success to play to the strength of your business against other small, medium and even enterprise businesses. Learn new approaches to recruiting the most talented employees in this competitive market, and once you've recruited them, how to maximize their potential. 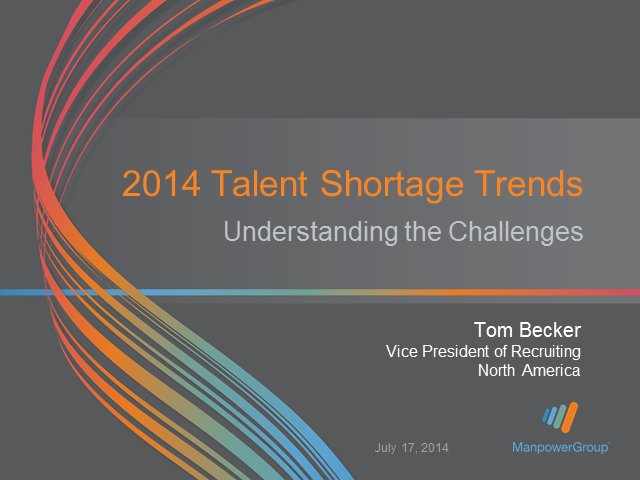 Tom Becker is vice president of recruiting for ManpowerGroup North America. In his role, Tom is responsible for developing the recruiting strategy and overall operational framework, with a focus on creating a world-class recruiting organization across all of ManpowerGroup’s lines of business. Most recently, Tom served as vice president of recruiting for North American operations for the ManpowerGroup brand, Experis. Tom joined Experis when Manpower acquired COMSYS in April 2010. At COMSYS, he served as senior vice president of recruiting, leading the company’s recruiting, employment branding and the consultant experience organizations. Tom has extensive experience leading large recruiting and change management organizations. He is considered an industry recruiting expert, providing public commentary on recruiting best practices and innovations.